One of our favorite times of the year began today. It’s time for U-Pick. If you’ve never been picking before, here are a few things to consider. Bring water, snacks, hat, sunglasses, sunscreen, etc. when you go to pick. Some places want you to have your own containers. Other places provide them. 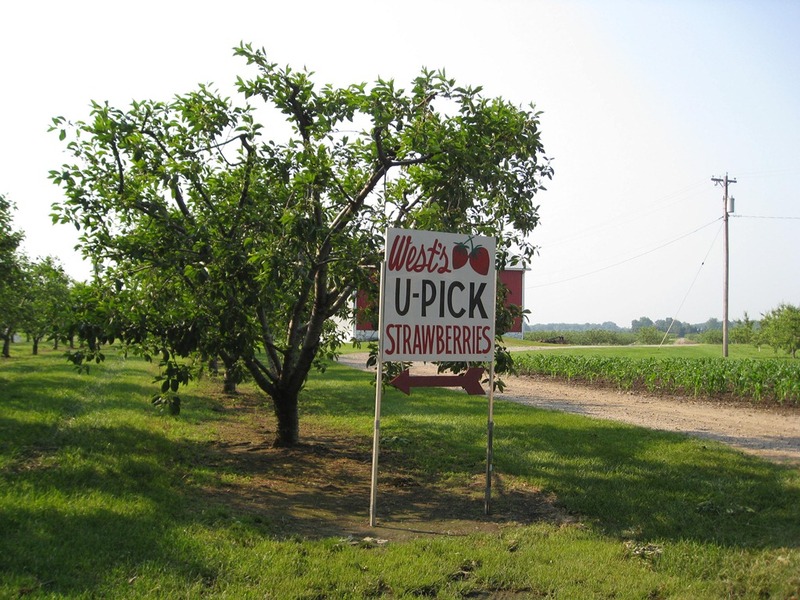 Call ahead and make sure u-pick is open. Many places only pick for a few hours a day depending on condition. Most places are “reasonably” stroller friendly, but keep in mind you are in the fields – it’s a perfect time for the stroller with the big wheels. Ask about restrooms or port-a-jon availability when you call to verify hours so you aren’t caught off guard, especially if you take little ones. It’s nice to have correct change, so it’s a good idea to stock up on small bills for u-pick farms. Some places will have parking close to the fields, but at others you will have a walk to get to picking. Www.pickyourown.org is a great resource. Also, pick your own isn’t usually cheaper than the local market or store. 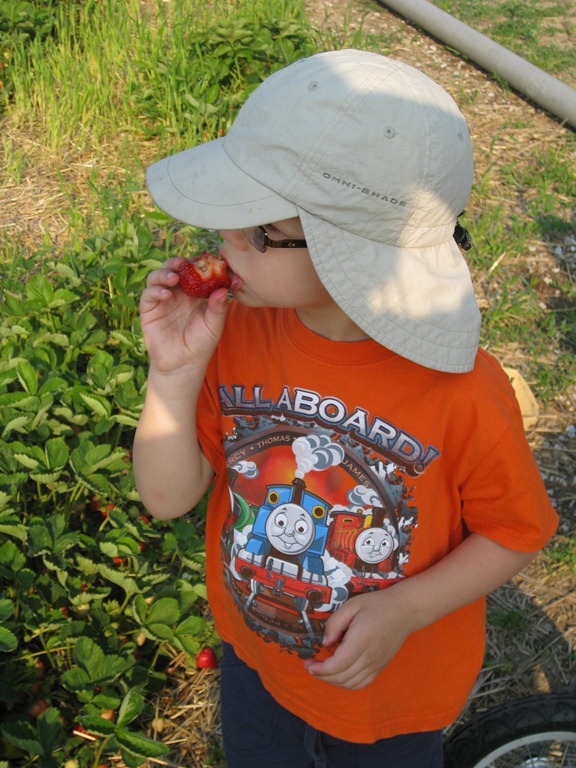 Pick your own is about enjoying the experience, seeing how crops are grown and and enjoying fresh and local. 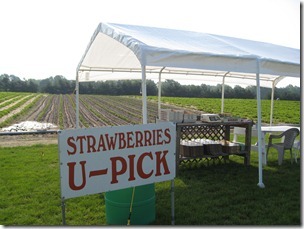 First up for the U-Pick season here is strawberries. This year, strawberries were a bit later than normal due to all of the rain that we have had. 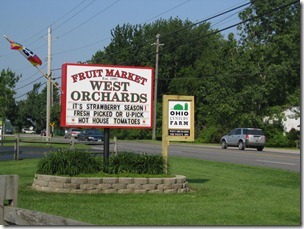 Today, we traveled to West Orchards Farm in Perry, Ohio. From our house in Mayfield Heights, it’s about 30 minutes away. It took us a few minutes longer today due to the construction on route 2. 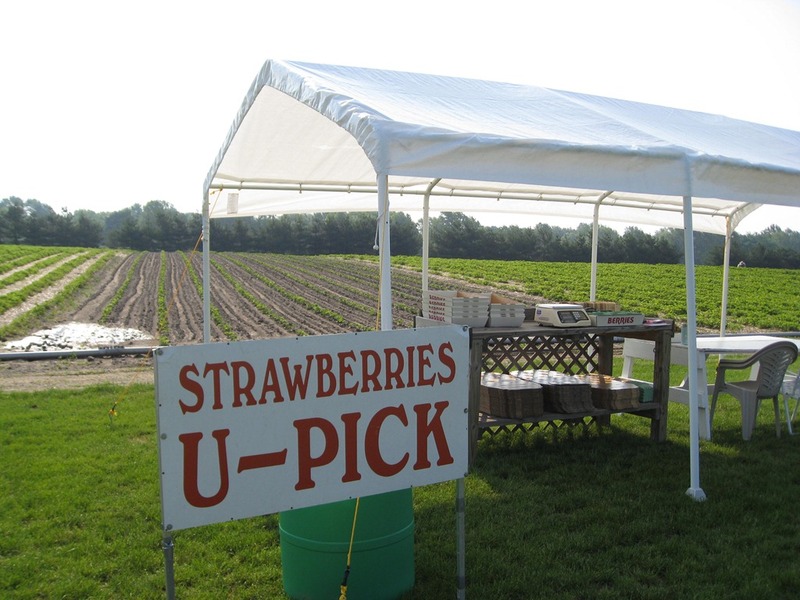 The U-Pick here opened at 8am. We arrived a few minutes after 8 and were the only ones doing U-pick! Here’s the view of the entrance of the market along with a sign directing you to the picking area. 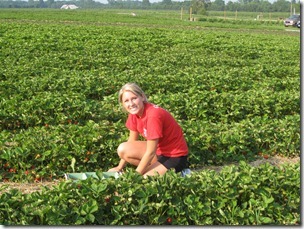 We were greeted by Allee who has worked at the farm for 5 years. She’s a student at Mt. Union and works here during the summer. She set us up with our containers and headed out to the field with us. When it’s not busy, she picks. West Orchards provides containers. The kids each had a small basket and I had a larger container for berries. We ended up picking 9 pounds of berries. 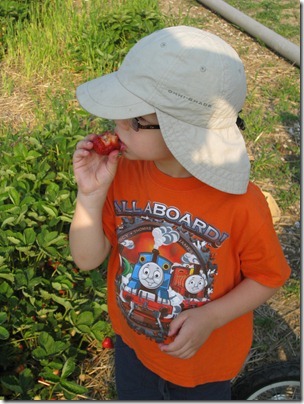 Here the strawberries were $2 per pound regardless of the number of pounds picked. 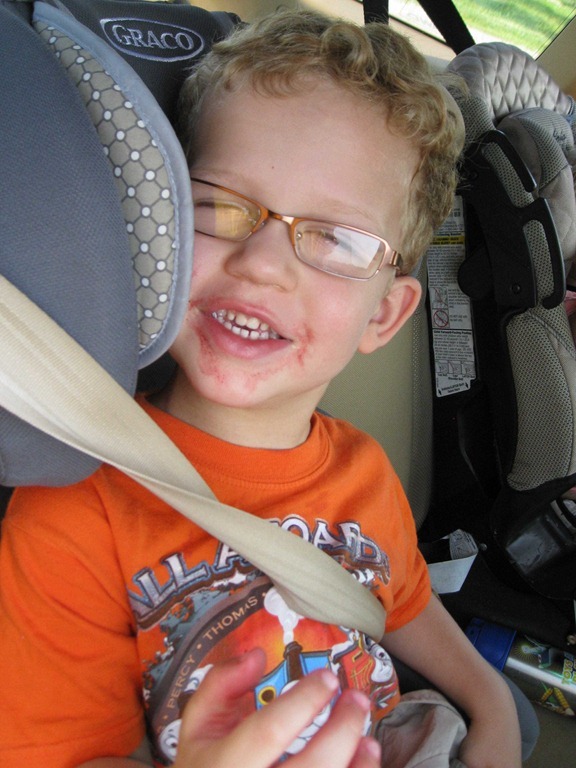 Nick enjoyed picking eating the strawberries. He had a red face and fingers to show for it. Sally spent most of the time in the stroller, so I didn’t get any good photos of her. I’ll have to try to capture her next time. We were able to park really close to the fields and there was a port-a-jon available as well. We’ll definitely be returning to West Orchard. If we don’t make it for more strawberries, we’ll definitely go out for sour cherries in a few weeks. Nick, Sally and I hope to be picking a couple of times a week throughout the summer as we enjoy our seasonal fruits and vegetables that are available for U-Pick in the area. I hope you enjoy our tour of the local U-Pick farms.